The interior of a Mini Cooper has so many bazaar shapes and curves. Not an easy car to mount a phone or GPS within. Forget about a tablet, there is no place to fit that device. it almost like the car designer had a goal of disabling the use of a car mount. Reminds one of a Mazda Miata. The vents are small and round with narrow slats, there aren’t any useful cup holders and it’s too small of a car for a seat bolt mount. Same problems as the Miata. A photo of the Mini Cooper interior is attached. It was taken of a convertible while the top was down. It practically the only way to get a good photo of the interior. The owner of this Mini Cooper was clever. Notice the GPS attachment over the speedometer. Figuring a GPS provides your speed, it renders a traditional speedometer redundant. So for those who like being non-traditional, consider copying what this person did and use a suction cup mount where the GPS is located. It’s not a bad idea. The speedometer is located almost at eye level and places the device very close to the driver. 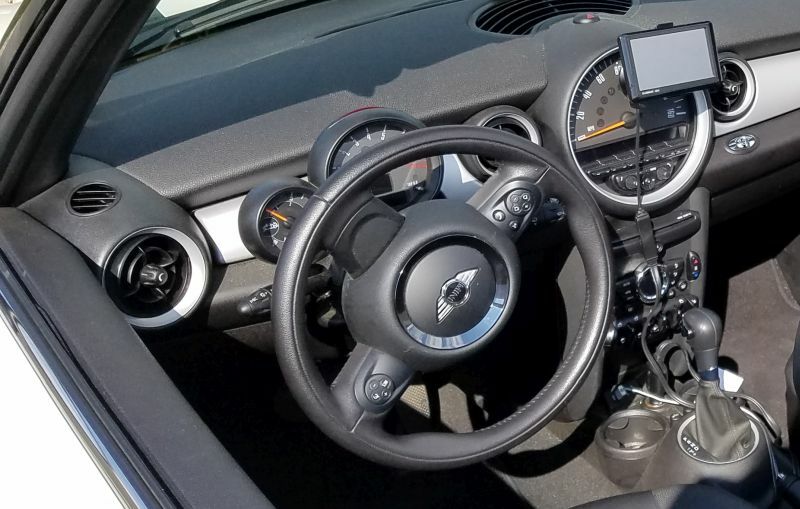 Consider the Arkon Windshield Dash Garmin Nuvi Suction Mount for either the speedometer or windshield on the Mini Cooper. It’s an excellent mount that comes with a 2-year warranty. It’s more rugged and longer than the Garmin mount you received in the box with the GPS. You can also attach a smartphone to the windshield. Our go-to mount for this location is the Arkon MegaGrip Suction Cup Windshield and Dash Mount. This is going to work fine in a Mini Cooper. The included expandable cradle is going to fit almost any phone as it opens to 3.4 inches. Cases or skins will fit fine. The phone can be rotated into landscape or portrait. The suction mount features a vacuum locked suction assembly attached to a pivoting arm. The mount also comes with an adhesive disk that you can stick to the dash to turn the mount into a console mount. The suction assembly can adhere to the adhesive disk just like it would on a windshield. Attaching this to your dash might be tricky on a Mini Cooper. The best place appears to be near the center. Don’t place it in front of the driver as it may block too much of the view of the road. A Mini Cooper has small round vents with am knob in the center. A vent mount will not work well. We’re recommending against using a vent mount in a Mini Cooper. Forget about the floor mount. We often recommend a floor mount for tablets and satellite radio. A Mini Cooper is too small to accommodate a seat bolt mount. Negative on a cup holder mount. While the cup holders are forward towards the dash, they are too close to the gear shift and will get in the way when shifting into Park. How about a CD player mount? Well, you need a CD player installed to use it, and as far as we know, the Mini Cooper no longer offers this in their cars. The Mini Cooper is a tough one to mount a phone, GPS or tablet in. The interior design rules out a lot of mounting locations so bottom line: Windshield good, Dash maybe, No to everything else.